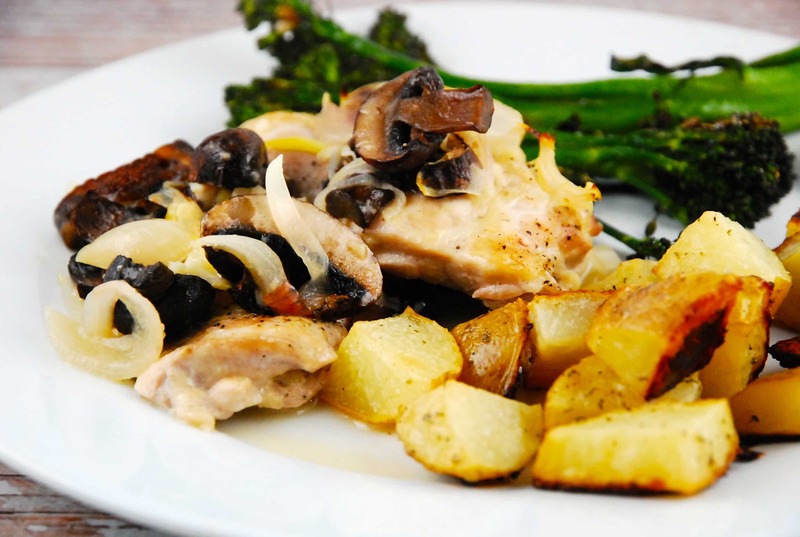 Today’s Mushroom Chicken with Creamy Wine Sauce has quickly become one of my all-time favorite Weight Watchers Chicken Recipes. The earthy mushrooms and juicy, tender chicken are roasted to perfection and then smothered in the most divine, creamy wine sauce. It tastes fresh from a restaurant, yet is quick and simple to prepare at home, with very minimal prep. The sauce was so good, that I was actually spooning out the remaining bits of it from the baking dish before I washed it. Yes, I did. No shame in my game! And at just 6 Smart Points per serving, this is an ideal light and tasty dinner recipe for a busy weeknight. If you want to make an average meal taste like you slaved away all day in the kitchen, this Mushroom Chicken with Creamy Wine Sauce is a must try. Enjoy! Juicy chicken and tender mushrooms served with a creamy wine sauce makes for one mouthwateringly good dinner. Its’s fast and easy, but tastes gourmet. Preheat oven to 400 degrees. Mist a baking dish with cooking spray. Place chicken thighs and mushrooms in baking dish and season with salt and pepper. Roast in oven for 25-30 minutes or until chicken is cooked through. While chicken is cooking, melt butter in a saucepan over medium high heat. Add in shallots and garlic, and cook until shallots become translucent, about 3 minutes. Pour in the wine, and cook until wine has reduced by half, about 5-7 minutes. Stir in broth and sour cream and cook until sauce is evenly heated, about 2-3 minutes. Pour sauce over chicken and serve. This recipe is still based on Smart Points. I haven’t recalculated my older recipes to the new Freestyle Points yet. So, as of right now, the only recipes that are freestyle smart points are everything after Jan 1 2018. Actually, because of the heavy cream, this recipe still comes out to 6 Smart Points per serving. I calculated it in my Weight Watchers Recipe Builder, and the only ingredients I counted were the ones that were not 0 Points.